The May Investigation is long gone now, and the discs all on their merry way out to their new homes (please let us know if you didn’t get yours yet!). In fact it’s not too long now ’til the June Investigation, anyone fancy a chilly winter’s night hunting the paranormal? We still have spaces available (and our awesomely exclusive beanies to give away to keep your heads toasty warm!). As part of the May investigation I was able to continue the experiment with our CCTV system in the Separate Prison, and with many wires and thingamabobs was able to get a functioning feed going throughout the night. Sadly it didn’t pick anything up in the way of paranormal activity, but with more work we will achieve our dream of streaming the prison feed into the asylum on the big screen (now there’s a sentence you’ll probably never read anywhere else!). Fingers crossed. Thanks to everyone who came along for the May Investigation, and although it was a pretty quiet night all round, if anyone spots anything on those discs please drop us a line and let us know. Sometimes we might miss things! This coming investigation will also be part of the training experience for our two new guides, James and Meahd, who will be coming along to see how it all works, and to have a bit of a play with the equipment. Both James and Meahd have been ghost tour guides at Port Arthur for years, and have plenty of experience to share! They’ll both be Investigating with their own groups in the coming months. We’re very happy to welcome some new faces, and they seem pretty keen to start investigating. In other news, we recently also played host to a Malaysian film crew, who dropped by to do a brief spot of filming with us as part of a broader tour of Tasmania. They were more after a bit of a thrill, and perhaps less interested in the theory and equipment than we would’ve liked, but it was still a fun experience and a bit of a laugh for all involved. Finally, don’t forget you can keep up to date with our thrilling blog by subscribing by email on our home page. Go on, you know you want to! Got a question for the paranormal team? Send us an email at paranormal@portarthur,org.au or leave a comment here on the blog. Saturday 30th March was our most recent investigation, and an enjoyable evening to boot! There was a fairly ominous start to the night as the ghost tour guides were cleaning up the lanterns from the tours. A lantern glass propelled itself out of a lantern and on to the floor where it merrily shattered into tiny little pieces. Needless to say, the three guides (including Cait, the biggest sceptic on site) who had been standing there discussing the merits of smart phone ghost-photo apps were a little shocked, and when they tried to re-create the phenomena were unable to trigger any more exploding lanterns (much to the relief of our manager, who was less than happy to hear about the attempt to shatter MORE glass). So with this event in mind, there was a chill of promise in the air as we headed out the door to begin investigating. If nothing else we were keen to snap a photo of one small and fabled bunny lugging copious amounts of chocolate eggs about the place (we jest!). It was a fairly quiet night despite the perfectly creepy moon peeking out from behind threatening looking clouds, and in the interest of giving the group their discs as swiftly as possible I decided to forgo the third section of investigating and stick around in the Asylum alone to kick-start the data analysis process. Not something I thought through very well! After the group departed to check out the Basement and the Parsonage, and i settled in with a cup of tea to make fun line graphs out of some of the data, the wind picked up and started making the whole building sound alive. Things were creaking and banging and more than once I though I’d heard the group return only to find nobody at the door! It’s amazing how easy it is to freak yourself out in a dark and creaky ex-Lunatic Asylum in a 19th century Convict prison at 1am. Really, what was I thinking? In other news we were joined by James for the investigation, one of our Ghostie guides who was keen to have a look and see what we get up to so late at night. He seemed to enjoy himself, so now we’re going to work on convincing him to become the latest addition to the P.I.E. Team! We’ll keep you posted if we’re successful with recruitment. Also, next week we’re having our brand new Promo photo shoot here on site, so keep an eye out for some glossy new pics depicting the glamour and glitz of late night Investigations very soon. Here’s hoping something spooky will pop up in the background of some of the shots? Finally, the April investigation will take place on Saturday the 27th, and there are only a few tickets left so head over to the Bookings site to get involved before we fill up! Lurking in the dark – behind you! Hopefully analysis of the footage may give us some evidence of this and the various other anomalous events experienced on the night. We had a bit of a play with the ‘Human Pendulum’ theory (as taught to us by Mark Rablin of Bodmin Jail in Cornwall on our ghost tour of the world back in 2010) in the Senior Surgeon’s Basement, and got some quite interesting responses which should be fun to review on the video cameras. We also test drove our now much louder (yet still slightly controversial) Frank’s Box in a few of the buildings and did seem to yield some kind of response. Saturday night we also welcomed our newest member of the Paranormal Team, Andrew, who had a great time and is really excited to get out there again soon after such a successful night of investigating. On reviewing some of the photos last night we came across one that made us stop and do a double take. 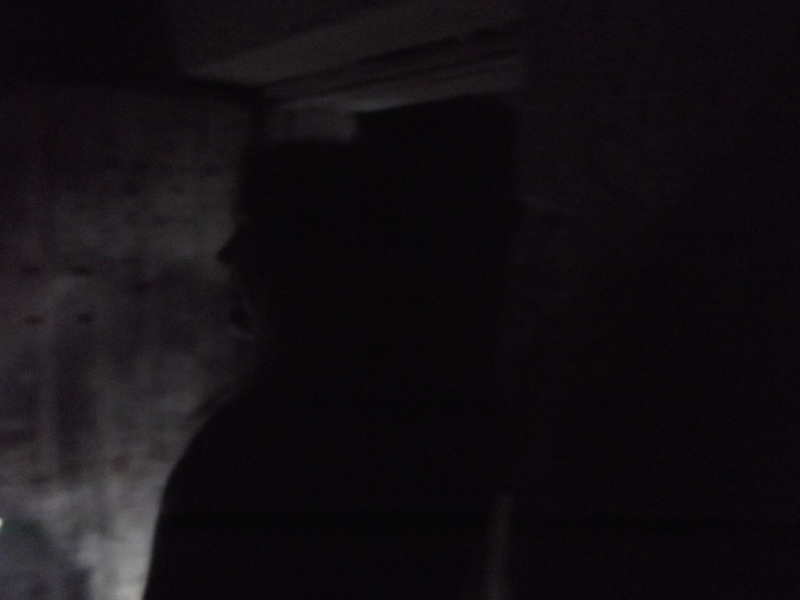 This photo is one that we’re pretty sure is a prime example of pareidolia – at least we hope so given the fact that otherwise it’s an impressively creepy figure lurking in the dark behind one of the participants! The next Investigation is December 29th for anyone who wishes to come along and take part, and the great news is that this January we will be running investigations every Saturday Night! So there are plenty of opportunities coming up to get involved and try your hand at investigating. It doesn’t matter if you’re the most experienced Investigator in the world, or have no experience at all, everyone is welcome. Please note – we encourage visitors to bring any gear with them that they might wish to use. If you have a camera, a camcorder, a sound recorder or anything like this, feel free to bring it along. The more devices recording the night, the better the data is at the end!